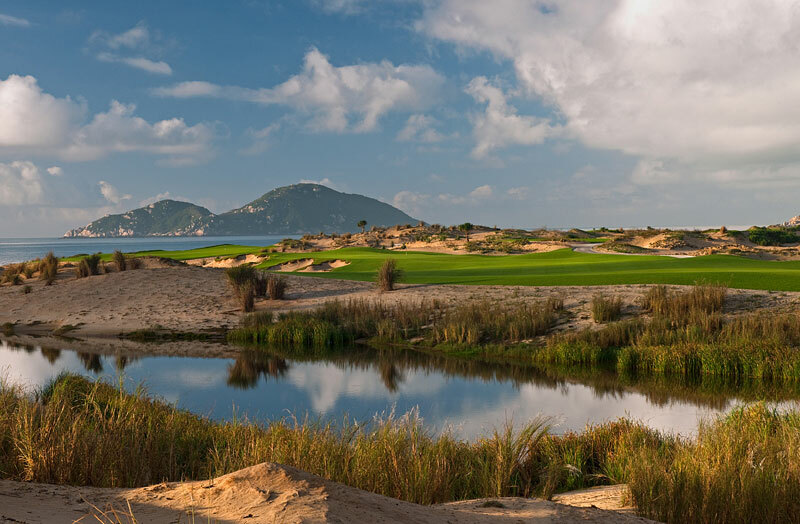 Located on the southeastern shore of China’s tropical Hainan Island, midway between Haikou and Sanya, the Dunes at Shenzhou Peninsula was developed by a subsidiary of the large CITIC Group and features 36 holes of golf designed by American legend Tom Weiskopf. 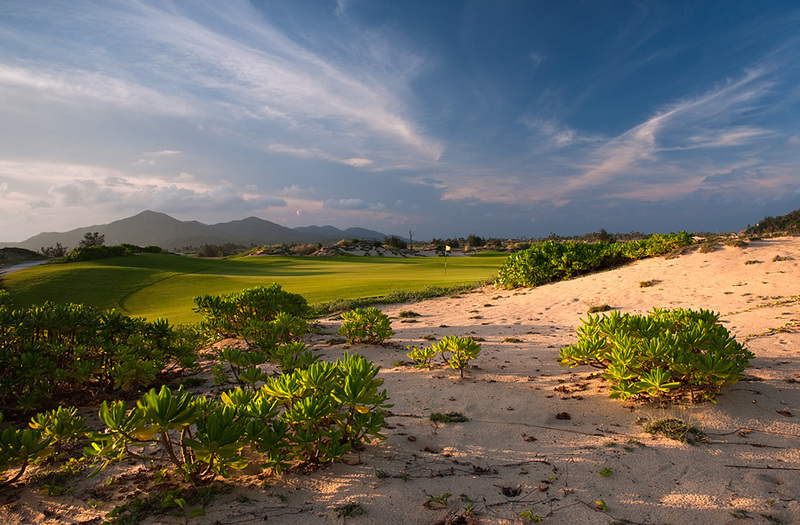 Both East and West Courses here are routed, in part, along the South China Sea and feature holes that touch the area’s pristine bays and beaches. The land Shenzhou Peninsula occupies was once a watermelon plantation and apparently when Weiskopf was first introduced to the area he was offered his choice of this property along with what later became the Shanqin Bay course. 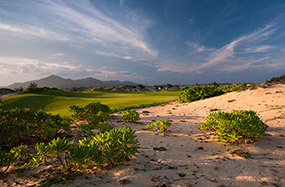 Weiskopf chose the Shenzhou site, in part, because of its absolute beachfront access but also the fact that the terrain was much more agreeable for golf. The soil was sandy and the lack of dense tropical vegetation and steep bluffs made creating the holes and features much simpler than at Shanqin Bay. Although on the surface it was more suitable for golf, the site was not without its challenges. Foremost was the lack of serious golfing undulation, essential when trying to replicate the classic links and build an old-school seaside golf course. Virtually all of the internal fairway and green contours seen now on the site were hand manipulated by Weiskopf’s shaping team. That same team was also responsible for the jagged edge bunkering, which is a real feature here and aesthetically appealing across the property. The bunkering is central to the strategy and style of the entire golf experience, with vast expanses of dune sand transitioning elegantly, if a touch formally, into cleaner bunker shapes. The use of naturally occurring rock outcrops and shapely boulders is also effective, particularly on the beachside holes. 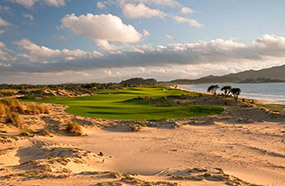 The principal attraction at Shenzhou Peninsula is the sea and for that reason alone the West Course is probably the most memorable, as it features more holes directly along the water. The entire development site comprises three separate curving bays, and the West Course is routed in such a way that its holes take up a large chunk of one bay and briefly point toward another. Within the confines of a 36-hole masterplan and residential subdivision, it’s hard to imagine making better use of these natural assets. 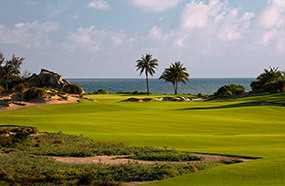 The course itself is arranged in a semi-circle, with the opening five holes playing southwest and away from the clubhouse and the rest looping back and toward the sea. After walking off the 5th green golfers stare straight out toward the western bay, before turning south and tackling a brutal par three across a wetland. Resting in the shadows of the region’s iconic boulders, the green here, along with the fairway on the left-bending 7th, is sheltered from the ocean by small hills. Nothing interrupts the view as the golfer stands on the next tee, however, with the par four 8th a genuine showstopper that heads right alongside the beach. After turning inland and returning to the clubhouse, the West Course ends with a stirring five-hole finale that takes golfers back down to this same spectacular bay. Understandably, the water holes are the standouts at Shenzhou but pleasingly there is quality to be found right across the West Course. Some of the non-beach highlights include the beautifully enclosed par four 7th, the partly obscured par three 10th, the fiercely protected push up green at the 13th and the charming, expansive linkslike target on the par five 14th. The memorable closing stretch starts with the short par four 15th, whose gently angled kidney-shape green is tucked behind a massive sandy waste and a single small pot bunker cut into its front. Like the 8th hole, sliced drives on the long par four 16th can literally end up on the Shenzhou beach, the approach then played across a sandy swale to a green similarly pushed against the shore. It’s certainly a spectacular test. As is the all-carry par three 17th, also set adjacent to the water and with a small green tucked beyond another large expanse of sand. Given its pure sand base, glorious beach and sea views and dramatic rocky outcrops, the West Course at Shenzhou Peninsula is sure to attract plenty of fans and destined to remain, for years, among the upper echelon of Chinese golf.